This summer I bought peanut butter from Costco for Camp Retz, expecting to use a lot of it for all the kid's sandwiches. But you know Costco sizes. Even making almost 10 PB&J sandwiches a day didn't dent what I bought and I still had a lot left over. I have a love/hate relationship with peanut butter. I'm currently not a big fan of it, but thankfully the husband loves peanut butter. So I scoured Pinterest for recipes to use up that peanut butter. 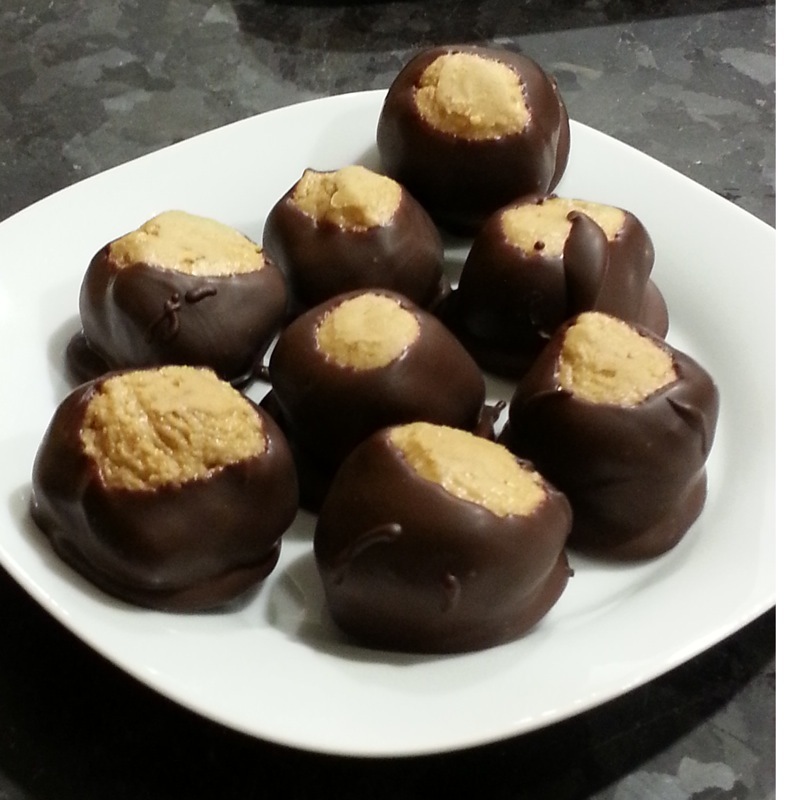 I decided to try this recipe for "Buckeyes". I have to admit, it's pretty good. But mixing and smelling all that peanut butter didn't make me like it more. So I probably won't eat more than 1 or 2. Unfortunately, Ninja Nephew is allergic to peanuts, so I can't unload some of them to their family. I'm getting together with some of my crafting friends tomorrow night, so I'll pass some on to them. But I'll dole the rest of them out slowly to Jimmy. 1. COMBINE peanut butter, butter, vanilla and salt in large bowl. Beat with an electric mixer on LOW until blended. Add 2 cups powdered sugar, beating until blended. Beat in additional powdered sugar until mixture, when shaped into a ball, will stay on a toothpick. Shape into 1-inch balls. Refrigerate. 2. PLACE chocolate chips and shortening in microwave-safe bowl. Microwave on MEDIUM for 30 seconds. Stir. Repeat until mixture is smooth. Reheat as needed while coating peanut butter balls. 3. INSERT toothpick in peanut butter ball. Dip 3/4 of ball into chocolate, leaving top uncovered to resemble a buckeye. Remove excess. Place on wax paper-lined tray. Remove toothpick. Smooth over holes. Refrigerate until firm.